Kirsty Moreau has come full circle with Niagara Health. Ms. Moreau completed several student placements at Niagara Health while she was enrolled in the Practical Nursing Program at Niagara College between 2008 and 2010. After graduating from Niagara College, she got a job with Niagara Health as a Registered Practical Nurse (RPN). A few years later, she enrolled in an RPN to Registered Nursing (RN) bridging program at Athabasca University. 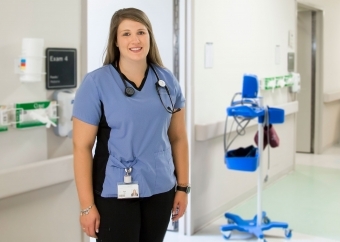 She completed her final placement for the program at the Welland Emergency Department in May 2016, and she landed a position as an RN in the same department after graduation. Ms. Moreau is grateful for her many placements at Niagara Health while she was a student. She says the placements, which included working in Women’s and Babies, Complex Care and Surgical, show nurses how many “different experiences” are available at Niagara Health. Every year, Niagara Health supports hundreds of student placements like Ms. Moreau’s across our sites. Last year alone, there were more than 1,900 student placements in clinical and clinical-support positions. We have more than 80 academic partners with the largest number of students coming from Niagara College, Brock University and McMaster University. Clinical placements for medical students are offered at our Greater Niagara General, St. Catharines and Welland sites through our partnership with McMaster University's School of Medicine – Niagara Campus. We’re extremely proud of our partnership with the Niagara Regional Campus of McMaster University’s Michael G. DeGroote School of Medicine. The campus opened in 2008 at the former St. Catharines General Hospital site, and expanded to Brock University in 2012 and the new St. Catharines Hospital in 2014. Each year, the Niagara Regional Campus accepts 28 new students into the three-year undergraduate program, where they will complete their clerkship at various Niagara Health sites, working alongside and learning from our healthcare teams. The campus also has approximately 25 post-graduate residents each year, who complete their residency at Niagara Health sites in such areas as family medicine, general surgery, emergency and mental health. Upon completion of their Post-graduate studies, many of the physicians have returned to practice medicine in Niagara.